Allan Simonsen didn't put a foot wrong during the four and a half day Classic Adelaide Rally last week. 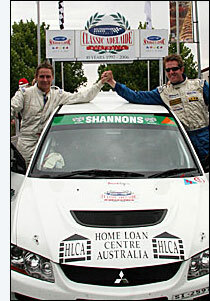 Driving the Home Loan Centre Australia Mitsubishi EVO-9, Simonsen consistently put in times better than both multiple Targa Tasmania winner Jim Richards and Classic Adelaide specialist and 2006 winner Rex Broadbent – although he was driving a more modern vehicle than the rest. He’s already committed to enter three tarmac rallies in 2007 - The Lake Mountain Sprint, Rally Tasmania and Targa Tasmania. "We had a great event,” said Simonsen’s co-driver Ben Searcy. "It was fantastic to get the chance to work alongside a famous international driver with so much diversified track experience from all over the world, and clearly Allan has now got a good grasp of tarmac. It’s back to dull old race circuits this weekend, for the final round of the Cue Enduro Sports Car Championship at Phillip Island, where Allan Simonsen joins regular partner Ted Huglin in the Consolidated Chemical Company Ferrari 360GT. With a strong lead in the Championship, he’s looking good for a win and an early Christmas present.